Fossil fuels are deposits of organic material that have formed within the earth from remains of dead plants and animals. Over millions of years, these remains have been subjected to great pressure and heat and turned to petroleum, coal, and natural gas. These hydrocarbons fueled the Industrial Revolution in the 18th century and bolstered economic growth and technological advancement, providing a better standard of living to many human beings around the world. Fossil fuels, nuclear power, and renewable energy such as hydropower and solar power, are referred to as primary energy sources. World consumption has increased from 3.8 billion metric tons in 1965 to 11.1 billion in 2007. We have to recognize the individual and collective madness that’s been wrought upon this earth. Then we have to rectify the harm. Certain gases such as carbon dioxide, methane, nitrous oxide, and chlorofluorocarbons are emitted from the burning of fossil fuels and these absorb heat. As atmospheric concentration of these gases increases, the temperature rises, causing what is called a “greenhouse effect.” The earth is less able to release heat from the earth’s surface, through the atmosphere, and into space. Scientists now realize that the issue is not just global warming but the more comprehensive issue of climate change, disruption of ecosystems, and harmful impacts on human survival. While some areas will see benefits such as a longer frost-free season for growing crops, the potential damage from climate change is striking. Increased precipitation in some areas such as the northern U.S. has the potential for destructive and deadly flooding; other areas of the U.S. such as the southwest will continue to experience heat waves and droughts. Extreme heat days were considered one-day events every 20 years or so. Now they are projected to occur, by the end of this century, every two or three years throughout the U.S. According to NASA, hurricanes are becoming stronger and more intense, increasing since the early 1980s. They also project a rise in sea level of 1-4 feet by the end of the century, as a result of melting icecaps, with an ice-free Arctic Ocean in summer projected by mid-century. In 1999, the death of the last Golden Toad in Central America marked the first documented species extinction driven by climate change. Due to melting ice in the Arctic, polar bears may be gone from the planet in as little as 100 years. In the tropics, increased sea temperatures are causing more coral reefs to “bleach,” as the heat kills colorful algae that are necessary to coral health and survival. Several U.S. states may even lose their official birds as they head for cooler climates — including the Baltimore oriole of Maryland, black-capped chickadee of Massachusetts, and the American goldfinch of Iowa. Desertification is defined as “the process by which fertile land becomes desert, typically as a result of drought, deforestation, or inappropriate agriculture.” One-third of the earth’s landmass is desert. The World Meteorological Organization, in a report “Climate change and desertification,” states that carbon dioxide-induced climate change and desertification are “inextricably linked.” Desertification is exacerbated by alteration of patterns in “temperature, rainfall, solar radiation and winds.” They forecast that at lower latitudes, crop productivity will be negatively impacted by even small temperature increases. African agriculture will be disturbed by shorter growing seasons and thus potential crop yield, especially in the semi-arid and arid regions will be less. Effects in Latin America include salinization and desertification of fertile land. More frequent droughts in Europe will diminish water reserves, limit hydropower, and impact crop yield. Many researchers advise caution in linking climate change and conflict. But many studies see climate change as a “threat multiplier,” if not a direct cause of conflict. There are many factors at play including poverty, ethnic tensions, oppression, political instability, and territorial disputes. Certainly, though, climate change and the negative impacts on food and water availability, forced migrations, illness and death – all contribute to and exacerbate conflict. As reported on Voice of America’s website (VOA is the U.S. government’s official broadcaster outside the U.S.), John Kerry noted in his speech at the international anti-corruption summit in London on May 12, “We are fighting a battle — all of us — for our states, for our countries, for our nation state. Corruption is as much of an enemy because it destroys nation states as some of the extremists we are fighting.” He continued, “The extremism we see in the world today comes in no small degree from the utter exasperation that people have with the sense that the system is rigged,“ adding, ”And we see this anger manifesting itself in different forms in different elections around the world — including ours.” The corruption he is referring to is the tax evasion and money laundering that is highlighted in the Panama Papers. But corruption is like an octopus, extending its tentacles as far as it can reach. It includes the kleptocratic nations in which state revenues provide for lavish lifestyles for the political and business elites while the general population languishes in poverty. This is often the case in resource rich countries. Nigeria is just one example. The largest nation is Africa, with 47 percent of West Africa’s population, Nigeria has Africa’s largest natural gas reserves. Oil has fueled economic growth; however, roughly 70 percent of Nigerians live on less than $1.25 per day according to the International Food Policy Research Institute. The corrupt mindset that offers or accepts bribes, that enriches itself at the expense of many, that games the system to acquire and protect its power, privilege, and wealth, is the same mindset that pursues profits no matter the cost to the well-being of people, to safety, to the ecological balance of the planet. Despite the urgent call for clean energy alternatives and the science community’s warnings that fossil fuel must largely be left in the ground, the oil/energy companies have increasingly divested from alternative energy research and development and double-downed on their investments in “dirty energy” — drilling, fracking, and other pursuits of biofuel. In 2015, the Islamic Declaration on Climate Change was adopted at an International Islamic Climate Change Symposium in Istanbul. The declaration calls on Muslims around the world to actively support and advocate for global, national, local, and personal measures to combat climate change. The Declaration speaks of the corruption (fasad) that results from following a model of ever-expanding economic growth and immoderate consumption. 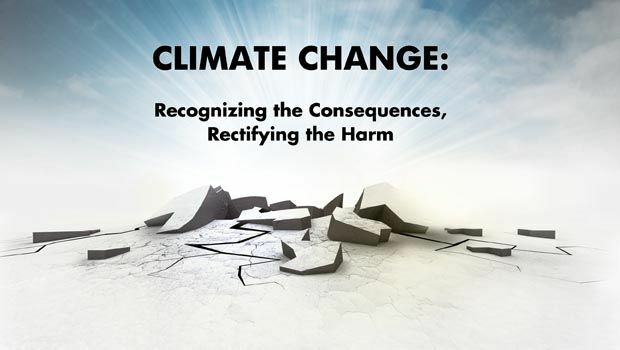 They detail the toxic consequences in addition to climate change – “contamination and befoulment of the atmosphere, land, inland water systems, and seas; soil erosion, deforestation and desertification; damage to human health, including a host of modern-day diseases.” The Declaration states that humans are accountable for their actions and that Muslims should live according to the example of Prophet Muhammad. The Islamic Declaration on Climate Change is well worth reading in its entirety, and it is included in this issue for readers’ easy access. Conservation implies watching over, guarding, protecting. As to the natural world, that is to guard its integrity, its unimpaired and undiminished condition. It is to protect its balance and equilibrium, its seasons and cycles, its interdependence of eco-systems. As to the human world, we are enjoined to protect our integrity as well, in the smallest to the grandest matter. That is the conserving part. The other just as essential part is the growth aspect of our human condition. There are many constructs of transformation in Islam. Fundamental examples include Islam to eman to ihsan; or the lower, base soul to the self-reproaching soul to the tranquil soul. Along these lines, the Quran tells us, “You shall surely travel from stage to stage” (Quran 84:19). And the Prophet (peace be upon him) said, “He whose two days are equal surely is a loser” (Al-Daylami). Imam Al-Shafa’a was asked why he often used a walking stick since he was not old or ill. He said that the walking stick reminded him that he was journeying (Kitab Madarej Al-Salekeen). And of course there is the oft-quoted verse, “Verily never will Allah change the condition of a people until they change what is in themselves” (Qur’an 13:11). These examples and references all connote transformation — expanding consciousness and self-awareness, action-taking, and chiefly, purifying of the heart. That is devotion to cutting through the egoic constructs that keep us stuck in useless or detrimental habits of thought, emotion, and/or behavior – as individuals, groups, and nations. We must protect the earth. We must change any conscienceless habits in our daily lives. The natural expression of life must be a passion for humaneness. Otherwise it is nothing more than compulsive drive for dominance, with all the destructive force that entails – exploitation, conflict, dispossession, death. Our devotion, our zeal, must be to cultivate in our minds and hearts a corrective to the ego’s self-serving promptings and, thus, the incapacity to harm others or commit injustice. The activism necessary to pressure our government officials to rectify the harm done by burning fossil fuels is the same activism necessary to pressure corporations to prioritize human well-being and environmental integrity before profit. That same activism must infuse our will to transform ourselves. The pollution we see around the globe is all the negativity we hold within our minds and hearts, expressed in resentment, envy, hatred, anger, feelings of superiority or inferiority, and so on; inner pollution that humanity projects outward. Part of the surrender to God is an acceptance, on the most basic existential level, of the inner and outer conditions we face. Then we can liberate ourselves from resistance to what beleaguers us. This frees up incredible energy to take action to change whatever needs to be, and can be, changed. The path beginning in Toledo, Ohio encircles the globe and comes back upon its starting point. No trajectories lead out of the connected, interdependent whole. To realize that is to know that our mutuality can reside in peace or agonize in disharmony. In a state of disharmony, appalling dissolution is at hand when so many are willing to poison the oceans and rivers, cut down the forests and destroy the habitats of a myriad of species, or drill out of the earth the organic residue, formed over eons, that when burned causes a dangerous imbalance in nature, threatening survival of life on this planet. We have to recognize the individual and collective madness that’s been wrought upon this earth. Then we have to rectify the harm. Purify the heart, guard our relationships, feed and protect the needy, dispossessed, and vulnerable; honor and respect women, elect mature and ethical government officials, rally to end the culture of browbeating, coercive foreign policy and endless war-making; advocate sustainable energy, push for an economy that puts people and living in harmony with nature before profits. That’s enough to start. “And We will surely test you until We make evident those among you who strive and persevere in patience; and We will test your affairs” (Quran 47:31).